My 9th favorite moment of 2015 would be the day in February that I donated the ‘Yarnbombing For Lunches’ auction funds to the Eatonville School District’s business manager, Daniel Lunghofer. Yarnbombing For Lunches raised $400 to donate to the Eatonville School District on behalf of students with negative lunch accounts. Here I am personally delivering the money order to the school business manager Daniel Lunghofer. 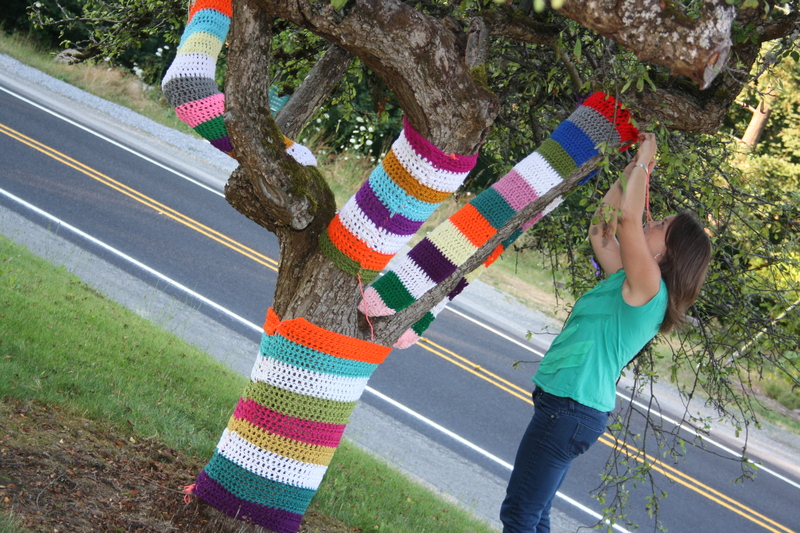 It had taken a year of planning and creating to pull off the yarnbomb of downtown Eatonville. It was a large public display of art created with hand knit and crocheted fabric that was then sewn around trees, lamp posts, benches, and rocks. It looked amazing! Thanks to the efforts of talented Eatonville fiber artists who joined forces to put their art to good use; raising money to pay off negative lunch accounts in the Eatonville School District. We wanted to change the policy of trashing food because of insufficient funds and create better communication from school to home about account balances. Our goal was to raise $500. We got close with $400 raised in all. Through our donation, we were able to do what we set out to accomplish! Robo-calls were put in place to call home to inform parents about lunch account balances and the policy has been updated to forbid the taking of food from the kids. Success!